Do you want to update the floors in your home? At Enjem’s Carpets of Utica, Inc. we have the perfect solution with our durable and cost-effective vinyl flooring in Utica, FL. Vinyl is a great investment when you are remodeling your home. It provides a comfortable and beautiful surface that looks great in any room. Moreover, with the nearly, infinite styles, designs, and colors it comes in, you will quickly find a solution that fits into your property. 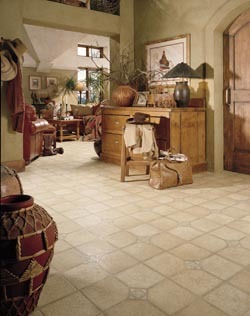 When you want the appearance of wood or tile, but need a softer surface underfoot, then vinyl is the right way to go. We offer vinyl tile flooring to mimic the look of natural stones and ceramics while providing vinyl planks that give the appearance of hardwood. Both our vinyl tile and plank solutions offer the same exceptional durability that you expect from vinyl. This allows you to get styles and designs in areas where the natural materials are not practical, such as in bathrooms or basements. Vinyl is moisture and stain resistant, making it perfect for areas where messes and water is commonly found. Furthermore, vinyl helps reduce static electricity, making it a good fit in rooms with sensitive electronics or computers. To learn more of the reasons why choosing vinyl plank flooring or vinyl tile is an excellent idea for your home, come into our showroom. Our team is always happy to answer your questions while you explore our collection of great vinyl products. One of the primary reasons to choose a vinyl surface for your home is that it is easy to maintain. Simply sweeping or mopping is enough to clean up most spills and messes, no need for special polishes or waxes. When combined with the unmatched water resistance that vinyl sheet flooring provides, you have a surface that will hold up to life in your busy household. While vinyl is easier to install than other flooring materials, it is still recommended to let our team handle the work. Our installers have the tools and experience needed to lay down your new surface, making sure that there are no gaps or spaces under or around the floor. This ensures that your vinyl flooring installation looks as excellent as it did in our store and that it will be a long lasting solution in your home. Contact us when you are interested in installing vinyl floors in your home. We proudly serve Utica, Clayville, Clinton, Frankfort, and Herkimer, NY, as well as the surrounding areas.